What happens in the brain of compulsive drug users? UNIGE researchers have pinpointed the circuit of the brain that controls addictive behaviour. What happens in the brain of a compulsive drug user? What is the difference in brain function between an addict and a person who takes a drug in a controlled manner? In an attempt solve this puzzle, neurobiologists at the University of Geneva (UNIGE), Switzerland; have been looking at this difference in a rodent addiction model. They have discovered that the brain circuit connecting the decision-making region to the reward system is stronger in compulsive animals. The researchers also found that by decreasing the activity of this circuit, compulsive mice were able to regain control and that conversely, by stimulating the connection a mouse that initially remained in control became addicted. The work is published in this week’s edition of the journal Nature. 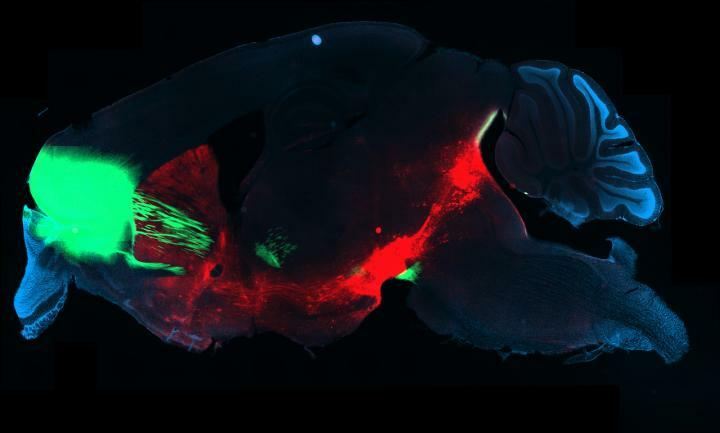 As a model of addiction, the researchers implanted mice with an optic fibre, which enabled the animal to stimulate its reward system located at the top of the brainstem. Pressing a small lever turned on a laser whose light activated a molecular switch previously added to nerve cells. The very same cells are activated by addictive drugs and are responsible for the behavioural reinforcement. “We then introduce a weak electric shock so that we could observe, which mice continued with the self-stimulation,” explains Vincent Pascoli, the study’s lead author and researcher in UNIGE’s Department of Basic Neurosciences. “This allowed us to identify the mice that had become compulsive.” Forty percent of the animals quickly stopped activating the lever following the introduction of the punishment. But 60% paid no heed to the negative consequences and continued to stimulate their reward system.